On February 12, 2014, a big snow storm hit the east coast. The storm brought snow almost all day, followed up by ice at night. It was a traffic nightmare. 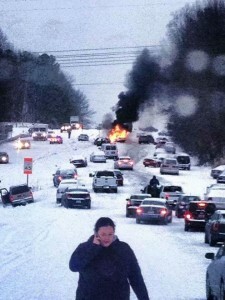 People were stuck in their cars, for 6+ hours. Some even had to abandon their cars and walk home in the snow. Lucky for me, I was off work that day. My wife and I stayed home all day, and watched the new reports. Today I want to talk about some things folks could have done to put themselves in a better position if something went wrong. Snow in the south is different than snow in the north! Before we move into the main topic, I need to talk about this. I lived in the suburbs of Chicago until I was 24. I remember driving in snow all the time. Here in the south it is very different. It is not just that we do not have the equipment to maintain the roads. We also see more ice than snow. We also have the people that “grew up in the north” and think they can drive on ice. I admit I was that guy when we first moved here. Now I LOVE the fact that the town shuts down. Now we can move on and get to things that can help anyone in this situation. The easiest way keep yourself out of trouble is to avoid it all together. That means when it snows you stay home. For most of us, this is not an option. My dealers policy is “we are open, get here if you feel safe”. I have only called in a few times. Like I said yesterday, I am an old school type dude. So this is not my first thought. I always try to make it in. But if you do not have to go out, don’t go out. This time I am not talking about maintenance. I am talking about having things you store in your car to be ready for a situation like this. You don’t need to have a giant SUV to keep a few extra things in your car. This advice comes from my buddy Lucas at TriangleTactical.com. It is something I never even thought about. Everything on this list, other than the get home bag, will fit in a small bag in the trunk of your car. Having a get home bag might make you seem like a crazy person. I can’t tell you how many people I seen get interviewed say they walked 2 miles, 5 miles or more. That is a long, cold, wet walk if you are not somewhat prepared. I am sure that some of those “walkers” did not have to abandon their cars. But it is not always about YOU and YOUR can. 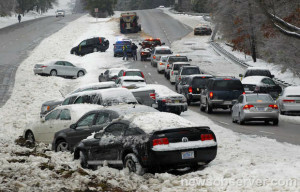 It might be the 10 cars in front of you, and 40 cars behind you that are stuck. I think back to something my mom always said to me. “It’s not you that I don’t trust, it’s all the other crazies”. I hope that you all will take 15 minutes tonight and evaluate your car kits. If you got stuck in the snow, would you be able to make it home 3 miles? What if you stayed in your car? Would you be freezing, hungry, and with out cell phone communication? Well, the Cabby is not running right now. So I have nothing in it. More updates on the Cabby later this week. The truck is about 50/50. We have first aid kits, flashlights, chargers, and water. But we need a get home bag. This will be done this weekend. I really do want you all to take some time and evaluate your car. Most of what you need can be found around the house. What you have to buy, think about hitting the Dollar Store. It is a great place to get things you will keep in your car. I would recommend buying a good quality flashlight. Did I forget anything? What do you keep in your car to keep you out of a jam? Post it up in the comments. It can help all of us safe. Thanks for linking Charles! My mom used to say the exact same thing! That is a good list. I would add having a sleeping bag in your car. If you leave it in the bag it came in, it doesn’t take up too much space. We have a couple of ones that are rated to something like 40 degrees in one of the under floor storage areas in our van. That plus our winter clothes should keep us warm if we end up spending a while in our van. You may also want to think about warm pants/snow pants to keep your legs warm and dry if you have to get out of your car. I agree with when it snows, stay off the roads if possible. If you haev to go out always take a cellphone and let someone know your destination and expected time of arrival, In particular if your travelling in remote areas. This is a panic situation, driving in Ice is not easy and only expert drivers should go out in such hectic environment. We should keep track of weather forecast for better safety option. Always I am afraid of this snow time. As a driver I can say, your necessary things are perfect for this situation.